Unalakleet Air Taxi was founded and Wilfred Ryan Sr. begins regular charter flights across Alaska. He flew all the flights for his popular air service. With assistance from his wife Eva, their business prospered. Wilfred Ryan Sr. hires a pilot and begins handling Alaska mail delivery between Unalakleet, St. Michael, Stebbins and other communities along the lower Yukon River. In 1977, Wilfred Ryan Sr. died of cancer. His son, Wilfred P. Ryan Jr., known to friends and associates as "Boyuck" took over the family business. 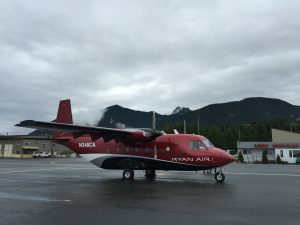 Boyuck took the company, now known as Ryan Air, from a small, three-plane, two-pilot operation to the largest commuter carrier in the state, with a new mission of providing air cargo service in rural Alaska markets. Today, Ryan Air is one of Alaska’s key Bush freight carriers, operating 14 aircraft out of seven hubs. We serve over 70 villages and employ over 90 people. And we’re 100% focused on providing cargo and mail delivery in Alaska’s Bush. Ryan Air purchases Pilatus PC-12 and begins offering passenger charter service based out of Anchorage. Ryan Air celebrates 60 years of operation this year, a testament to the vision of the Company's founders and the dedication of its team. Ryan Air begins scheduled passenger service serving the Aniak Region. Ryan Air begins operating 5th CASA, and continues to have the highest number of flights and flight hours in the worldwide CASA fleet. Ryan Air adds 2 SAAB 340s, based in Anchorage, to their fleet.